This question might be flanked by The Great Outdoors and Bicycles, yet I'll ask. When I am off for a mountain-biking thing, I usually have a backpack with me which contains clothing, medical kit, basic toolkit for repair, tarp, sleeping bag, food and water, etc. What would be the ideal method to carry it? Should I haul the pack on back or should I attach it to the carrier that my bicycle has? Lets consider a 35-Lt backpack and an offroad rough terrain with lots of ups-and-downs. I have a 20L Revelate seat bag on my bike and I love it, I still carry a small backpack, but I try to put all the bulky items in my seat bag. Heavy stuff should go inside a frame bag, but those are harder to come by because they need to be custom fit, but if you have a mainstream mountain touring bike like a Salsa or Surly, etc., then you can get one stock that fits your frame. When riding long distances, you want a little weight in your seat as possible, more weight on your back means more weight on your prostate or other tender bits. 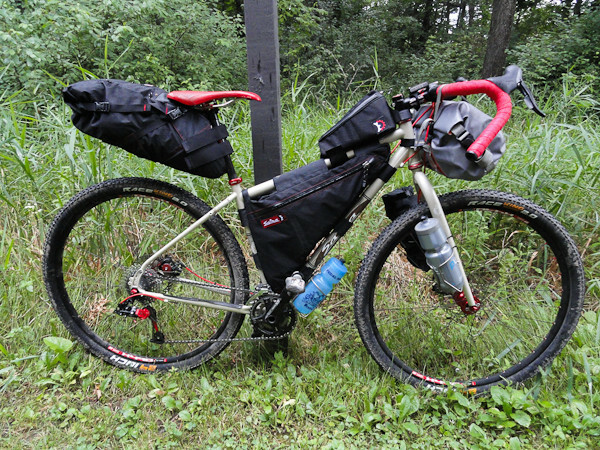 I'm still in the process of building a tour divide bike like the one pictured above, after all is said and done I plan on having mostly nothing on my back except a 3L water bladder and some empty space in a backpack that I only plan on using during those long stretches during the tour divide where you're without water and services for several days in a row. In my experience, as a mountain biker of 20-years, you want to seek weight minimization and distribution. A heavy pack (assuming a non-trivial ride length) is going to cause your lower back to hurt, make you hotter (back can't breathe), and put additional stress on the palms of your hands - all of which become more problematic the longer you ride. A heavy load on the back of your bike (rack or carrier) will interfere with your front-tires ability to remain in contact with the ground - making climbing and steering more difficult. A heavy load on the center of your bike and lower down will cause your bike to feel more sluggish - harder to turn and make for a less enjoyable ride. First and foremost, ask yourself what you can get rid of. Consider carrying patches + 1 - tube instead of 2 tubes. If you know you will have streams in the area, get a good filtration bottle to lighten the H20 load. Can you learn anything about the vegetation that will allow you to eat local plant-life to reduce the food you carry? Do you have high-end clothing that is both light and protective? You weren't really specific so these may be off base. The point is to be really creative on how you can carry less. No matter where you store it, less weight will always feel better as the ride gets longer. Also, you might consider a bike trailer. There are some really nice ones (example) that minimally interfere with your ride and will do a much better of carrying your gear comfortably than trying to put it all on you or your bike. In general I'd agree with Liam's answer that you should strap your gear onto the bike using a rack and/or panniers. On smooth terrain I'd take this route every time. The one time I'd disagree is if you're mountain biking over rough terrain. Adding weight to the bike is going to make your bike less nimble. Also if you're strapping a backpack on a bike rack you're really going to have to crank down those straps otherwise every couple of miles the pack is going to get loose. All that being said I'd seriously consider just wearing the pack on your back if/when you're riding over really rough terrain. It will be uncomfortable but I think it is more practical. 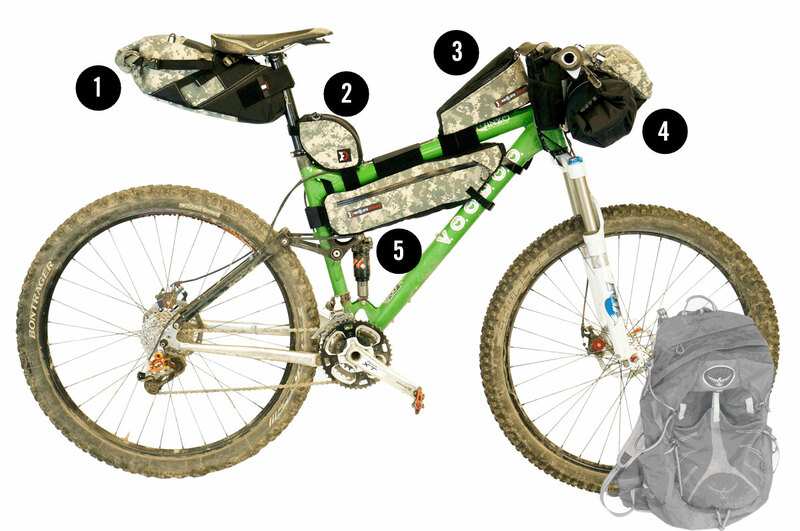 While I think for touring bike bags are the way to go they are horrible for mountain biking in serious terrain. 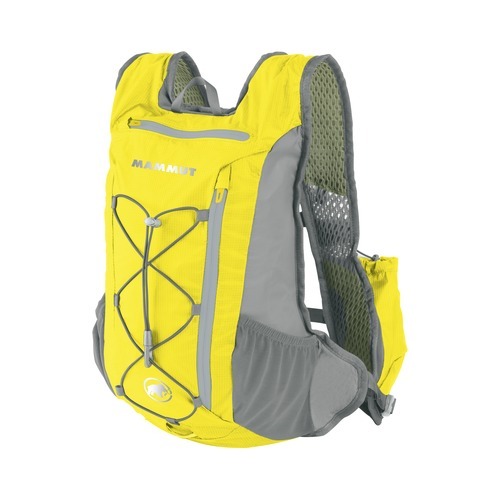 What I personally do on longer bike tours is to wear a trail running backpack. still not being heavy or bulky, and thus don't restrict your movement. You want to keep your centre of gravity quite low, so it depends on how heavy the stuff your carrying is. If it's light wear it on your back, if it's heavy put it on the carrier. 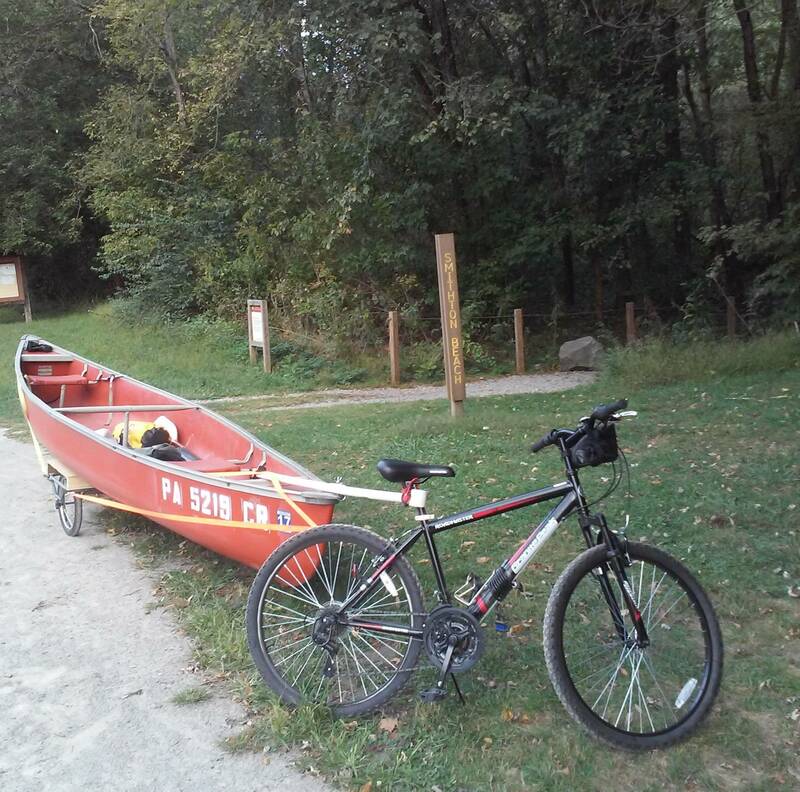 Related How to tow a canoe with a bicycle? When buying a backpack, what should I pay attention to? Why are backpack waist straps so long? Any reason to carry a mug outside of the backpack? What are these loops on my backpack for?